Expenses are rising as the gifting giant integrates a major new business line into its operations. 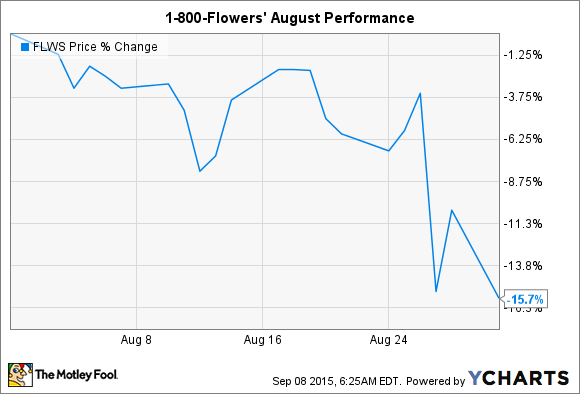 What: Leading online florist and gift shop 1-800-Flowers.com (NASDAQ:FLWS) saw its stock fall 16% during the month of August, according to S&P Capital IQ data. However, it is still up slightly this year -- and shareholders are sitting on a 40% gain over the last 52 weeks. FLWS is soundly beating the market over both of those year-to-date and 52-week time frames. So what: Last month's stock price swoon came almost entirely in the days following FLWS' fiscal-fourth-quarter earnings release late in the month. But keep in mind that this was also a time period coinciding with large sell-offs in the broader stock market. Still, Wall Street didn't get everything that it wanted out of the retailer's latest quarterly results. The company swung to a loss of $9 million, or $0.13 per share, compared to a $3 million profit, or $0.05 per share, in the year-ago period. And sales growth didn't meet expectations either, rising to $228 million rather than the $232 million that analysts were targeting. The profit difference apparently came from growing pains around FLWS' recent acquisition of the Harry and David brand. Management called the purchase "highly accretive," but the business is crimping short-term results as is absorbed by the broader florist operations. For example, seasonal swings mean that the Harry and David operations generate huge costs in the first quarter of the calendar year -- costs that aren't recouped until later in the year. Those expenses pushed FLWS' overall operating costs from 40% of sales to a painful 49.3% last quarter. Now what: But with those seasonal and one-time losses behind them, management now sees a strong year ahead for flowers and gift sales. They issued a new 12-month outlook that includes 20% higher per-share profits and sales gains of between 5% and 7% from the $1.2 billion annual result that it most recently booked. Investors should be happy with those results, but they should also expect to see expenses drop significantly as management works to integrate the Harry and David business into the fold this year.